"You'll just be sittin' around like this, and all of a sudden that gong goes off. You go tearing out of the firehouse, go down the street, and fight your way into some building, dealing with that heat, helping people, you know." After the heroism of 9/11, the daily dedication and sacrifice of our many firefighters, police officers and paramedics became clear. Hopefully, these feelings of appreciation and recognition will not dissolve like the short-lived period of nonpartisanship. The dangers and risks of public service are not to be underestimated; it's only natural that such real-life heroics would become fodder for feature films. Hollywood is a sucker for this kind of material, and one hopes the final product is an accurate, faithful representation. 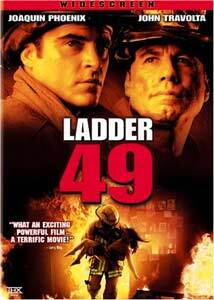 Sadly, Ladder 49 brings us no closer to the definitive firefighter film. Baltimore probational firefighter Jack Morrison is eager to start his new career. For him, firefighting embodies the admirable ideals: courage, honor, loyalty, bravery, and sacrifice are all rolled into one. Still, personal recognition is not foremost on his mind. After a rough start, Jack is quickly accepted into the brotherhood of the firehouse, led by the cavalier but sensible Captain Kennedy (John Travolta). Over time, Jack learns the ropes, meets his future wife Linda (Jacinda Barrett), and becomes a father. We follow the complexities and concerns of a firefighter with a family—a prospect riddled with difficulty. Sure, Jack's career is noble. He lives for the opportunity to save others, but at what cost for those who wait at home and worry? When the most horrific blaze of his career pushes Jack to the brink of death, the ideals of duty, loyalty, and family are put to the ultimate test. Ladder 49 never rises above a string of endless clichés, thin characterizations, and saccharine emotion. Each scene has its own well-defined, predictable purpose: we have the obligatory hazings; the bar brawl; the St. Paddy's Day drinking games; the domestic squabble. You name it, it's easily found in its expected place. Set amidst these contrived scenes are characters who never have distinct personalities or much in way of development. The film's forced nonlinear structure tries to keep us interested with a promise of victory that never comes; it amounts to a disappointing climax that is drenched in sentimentality and devoid of subtlety. The talent involved suggests this would be a successful project; Phoenix, Travolta, and the worthwhile Jacinda Barrett do what they can with the material. This is really too bad; we are always in need of some positive, heroic stories, and Ladder 49 may certainly deliver for some, but only those who are not very familiar with movies. The problem is we've seen this all before. The film's occasional glimmers of promise, found in some impressive special effects and occasionally sound camerawork, ultimately amount to an unrealistic feel. I never felt as though I was seeing the portrait of a true firefighter—only a Hollywood-ized version was apparent. An awkward, twangy honky-tonk score only furthers the cheapening. The filmmakers try their best to create a sterling tribute to our public servants. Sadly, they fall short. Our brave firefighters deserve better. Image Transfer Review: The anamorphic 1.85:1 transfer exhibits good color and deep blacks. Detail is good, but the image can have a hazy, muddy appearance. Grain is minimal, and the print is relatively clean. Audio Transfer Review: Touted on the back cover as an "Enhanced Home Theater Mix—a dynamic audio-sensory experience designed specifically for your home theater system," the Dolby 5.1 audio truly delivers. This is a dynamic, active mix that fully engages all the channels, placing you in the blaze, or on the fire engine. Well done. Extras Review: The extras begin with an audio commentary by director Jay Russell and editor Bud Smith. This is a very engaging, informative track that discusses various aspects of production, including casting and visual effects, with some dead air. Even Ron Howard's Backdraft is discussed. Fans will be pleased. The Making of Ladder 49 is a documentary divided up into three sections: On Location (05m:25s), Fire Academy: Training the Actors (07m:11s), and Anatomy of a Scene: The Warehouse Fire (08m:33s). This is a pretty comprehensive making-of with cast and crew interviews, plenty of behind-the-scenes footage, and covers such issues as casting, shooting in Baltimore, and more. Everyday Heroes is a tribute to real Baltimore firefighters, featuring interviews with Lt. Donald Shafer (who we see preparing to receive an award for bravery), his friends and family, other firefighters, and John Travolta. This is a rather brief look at the dangers of the job, but it's nice to see something like this included. This is the best feature on the disc. A selection of deleted scenes is included, presented in poor quality nonanamorphic widescreen: "Lunch Room Conversations" (03m:12s), "Jack and Linda's First Date" (03m:25s), "Capt. Tony Arrives" (02m:34s), "Ray's Subplot" (03m:00s) and "9-11" (01m:48s). There are some interesting moments here, but clearly these would have bogged down the film's pacing. Finally, you will find a music video for Robbie Robertson's Shine Your Light and a selection of trailers. Ladder 49 is not worth climbing, foundering in a haze of clich´s, thin characters, and overt sentimentality. It has a noble mission—to recognize the sacrifices of firefighters, both personally and professionally—but fails to inspire.